1) Gur(jaggery) : also known as medicinal sugar, it's unrefined wholesome sugar full of minerals & vitamins. It's a good source of magnesium, potassium, iron, selenium & also contains moderate amount of calcium, phosphorus & zinc, it also helps in the purification of blood. As per Ayurvedic diet it helps in throat & lung infections. Because of it's health benefits in India it's very common to use lots of gur in post partum diet, it's healthy & helps clean the body from inside after delivery. Also when babies start on solid foods it's good to use gur in baby food instead of using refined sugars. 2) Almonds & Walnuts : Now a days every where one can see the emphasis on heart healthy nuts : almonds & walnuts, so I'm not writing a lot about that. But I would only like to say that new moms need them much more than anybody else, as it will increase DHA & RHA in the breast milk which is very important for babies brain. 3) Ajwain( carom seeds) : It's an excellent cure for indigestion & low-appetite. Very beneficial in cases of cough,cold & asthma. Again new moms are suggested to eat 1-2 spoons full of ajwain during the period they are nursing, not only helps mom but also helps little babies from having gas pains & indigestion. For more home remedies using ajwain for little babies & kids click here. 4) Sund(dry ginger powder) : it's used in Ayurveda from centuries. It's used to treat indigestion, stomachaches, nausea, joint & muscle pains, loss of appetite, cough, colds & flu to name few. 5) Ghee(clarified butter) : it's obtained by gently heating the butter to the point where all the water evaporates & all the milk solids get separated. It's lactose free & also free of hydrogenated oils so good for health-conscious ones. Ghee is not only versatile cooking medium(has very high burning point), but as per Ayurveda it helps balance excess stomach acids and helps maintain & repair the mucus lining of the stomach. Helps lubricate the connective tissues & promote flexibility, used to promote memory. To me it's right kind of fat specially for babies & toddlers & also for new moms. 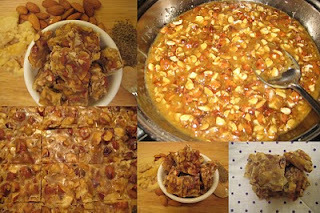 Note : this time I used pan roasted almonds & I love the taste better than plain ones. Also if preparing for post-partum diet you can double the quantity of ajwain & sund. Heat ghee in a heavy bottom pan on med. gas for few seconds then add gur to it & mix it. Once the gur is all melted add rest of the ingredients,stir it together. Turn off the heat & be careful it's gonna be really HOT don't try to taste it, it's gonna be tempting but control yourself. Take a baking tray or thali grease it with ghee & pour the mixture onto it & using backside of spoon spread it as evenly as u can. Once all set & cold to touch cut it into pieces. Let it cool completely before taking them out. Store it in air-tight container. No need to refrigerate it doesn't spoil use dry hands only. Note : It's very good for new-moms, I use to snack on these after having my second one. But any one can enjoy these they not only taste good but healthy too, only problem with these goodies is to stop eating them.......they are that tasty. these are so healthy...thanks for the info..loved reading the info of all the ingredients that went into making it..
Hi Spice, my first visit here, my mom had made a similar thing for me post delivery but apart from all these she had also added poppy seeds and some medicinal herbs in mine. A similar form of liquid drink is also made. Loved your detailed explanation of all ingredients. Thanks pari for stopping by.....u r right other medicinal herbs are also used for post delivery but we make that as separately called panjeeri(in north India)but this stuff is mainly from the purpose of getting enough of gur & dry fruits. Hi, there...you are more than welcome to send things that you want for our event "Home Remedies"It just have some tiny rules to follow..if thats the case go ahead..archives are fine too...just repost with event & remedy picture. Thanks!! @ Jaya, u can say it's similar to chikki but still different...as far my knowledge chiki is more crispy & sometime water or even regular sugar is also used in that whereas it's more soft & gur is not cooked for long(to make crispy), plus use of spices makes another difference. Je découvre ton blog et il me plait. This is to be a great healthy snack! I loved reading your post; very informative and the recipe is delicious. Now I am very curious about jaggery; I wonder how it tastes and if I can substitute jaggery in recipes with sugar, like cakes and cookies. Hi Spice, wonderful info about all the ingredients and a very nice recipe! Recipes like these are family treasures and work like magic! Thanks a lot of sharing.. thanks for stopping by my blog too; you have a wonderful space here, I'll be sure to visit often. This is an amazing recipe! Especially for people like me who forever crave an after-dinner sweet something ... love it! Thanks for stopping at my blog. You have a great space here! Thanks for this wonderful recipe--would love to try it one of these days. Sounds healthy and looks yummy! Are you a punjabi ?? sund is a punjabi name of the dried ginger root n that's why i asked..
i wanna have this gur right now..
my wishes for all of you for a happy new year...your sally looks awesome !! thank you so much, you went through all this trouble for me, sorry for the delay on my part, barely have time to come online anymore !! two kids!!agrh!! :( take care n thanks again.